8 colors - each piece 12 inches. 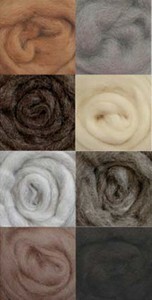 Light Grey, Medium Grey, Dark Grey, Smoke, Black, Natural, Camel & Toffee. Great assortment for animals.